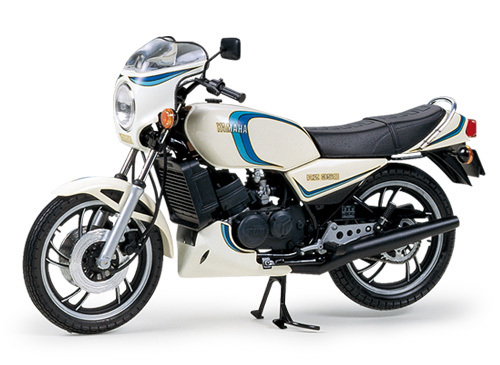 【 Taking On the 750 】　The RZ350 debuted at the 1979 Paris Motor Show as the RD350LC and became available in Japan in 1981. This bike incorporated features which were developed from Yamaha's racing bikes, including a 347cc liquid-cooled 2-cylinder 45hp engine, front double disc brakes, and monocross rear suspension. Due to its high performance, which allowed it to take on larger 750cc displacement bikes, the bike was given the Japanese nickname "750-killer." 【 About the Model 】　★1/12 scale plastic assembly kit of the Yamaha RZ350. Length: 174mm, Width: 73mm, Height: 100mm. ★All aspects of the bike, including its compact 2-stroke 2-cylinder engine and frame, have been accurately reproduced. ★Vinyl tubing included to depict brake and meter cables, etc. ★Parts for under-cowl and half fairing are also included to provide additional assembly options. ★Synthetic rubber tires feature realistic tread patterns. ★High-quality Cartograf decals included for both a black and a white bike.